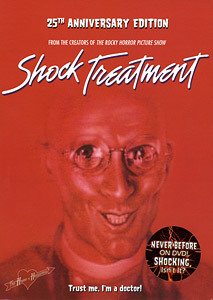 Released on September 5th, 2006 in America this is billed as the 25th Anniversary Edition of Shock Treatment. The sticker on the front of the slip case reads Never Before on DVD - Shocking Isn't It?. That only applies to the USA as the UK release was back on the 22nd May, however the region 1 American version offers so much more that the UK release! Although the exterior packaging is more or less the same images, there is an extra little box on the USA version marked Special Features and the main descriptive text is also ammended slightly. This version of the movie is shown at 92 minutes, rather than the UK 88 minutes, but there isn't any extra footage as such. 35mm film always runs at 24 frames per second, however the video systems each country uses vary across the world. In the USA their television system runs at 30 frames per second, so it is easier to convert film to video at the original speed. Ours runs at 25 frames per second, so the easiest thing is just to speed the movie up by 4% to fit the television frame rate exactly. What this means in practical terms is movies run a fraction faster here. As far as the quality of the image goes, it looks like the American market has used the same transfer to digital as we had here, there is no real difference in picture quality at all. What you do get with the region 1 disc is some more sound options. Rather than the 2.0 Psuedo Stereo mix that we had here in the UK, the USA platter offers both a Dolby Surround track as well as a remixed 5.1 Dolby Digital mix. There is also a mono Spanish soundtrack (Spanish is the second major language in the USA). There are aslo English, French and Spanish subtitles and the disc has closed captions added as well. The UK release just featured English for the Hearing Impaired. Where this disc really stands out though is the presentation and extras included. Starting with a six page booklet, that offers a few Revelations & Fiendeshly Fun Factoids - most of which fans would know already. There is also a couple of pages explaining why the movie had to be shot in the UK (the American actors were on strike!). 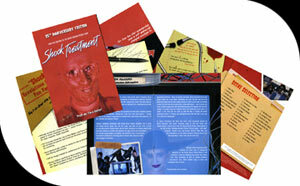 The booklet ends with a chapter selection list and a plug for the Shock Treatment fan club in the states. The UK version didn't even manage to get a chapter listing! The menu's on this version of the disc are fully animated, rather than the static ones we had on the UK release and follow the theme of the movie very well indeed. The real bonus though is the fan led extra features. First off, there is an option to select a commentary track from Bill Brennan and Mad Man Mike from the Shock Treatment Fan Club. They take you through the movie with and point out lots of information that the fans will appreciate. There are also two special featurettes made for the DVD. DTV Presents: A Shockumentary feature contributions from Richard Hartely, Patricia Quinn, Cliff De Young, Sue Blane, Sal Piro and others talking about the history and meaning of Shock Treatment. There is also the Let's Rock 'n' Roll: Shock Treatment's Super Score Featurette commenting on the music of the movie. There is also a USA and an international Trailer included on the disc. You can import the disc from Amazon.com in the states, just make sure that you have a multi-region or region free player in order to watch the disc here (most players in the UK now are either multi-region or easily adaptable with a few key-presses). So, we may have got the movie on DVD here in the UK first but the USA release is soo much better for both the presentation of the movie and packaging as well as the great bonus features. This is what the UK disc should have been. If you are only interested in watching the film itself, there isn't much to be gained in getting the region 1 release, however if you are a fan of Shocky, then get the disc for all the extra features, it's well worth it!